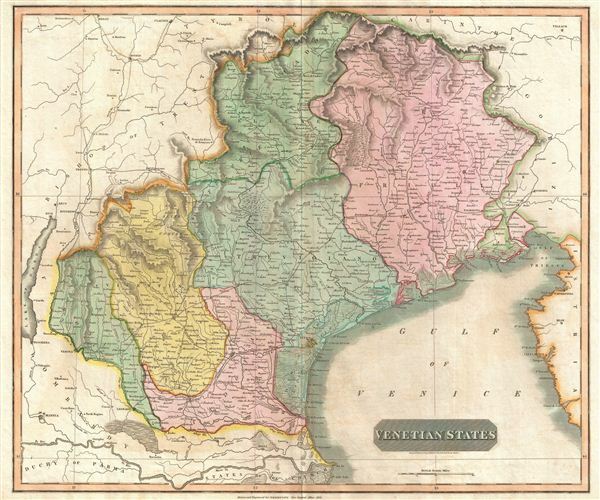 A beautiful example of John Thomson's 1816 map of the Venetian States in northeastern Italy. Thomson issued this map shortly after the dissolution of the Napoleonic Empire and the 1815 Congress of Vienna, which left northeastern Italy under the control of the Austrian Empire. Despite Austrian repression of the growing Italian unification movement, the Venetian States eventually became part of the Kingdom of Italy in 1866. The map covers the area from the Po River in the South to Gorizi and Istian on the far right. The whole is beautifully engraved in the minimalist English style pioneered in the early part of the 19th century. Relief is shown by hachure with towns, cities, and major topographical features identified. This map is a steel plate engraving by NR Hewitt, Charlotte Street, Fitzroy Square, and was prepared as plate 28 by John Thomson for inclusion in the 1816 edition of Thomson's New General Atlas. Rumsey 1007.000. Phillips (Atlases) 731. Newberry Library: Ayer 135 T4 1817.